Lalitpur, the 'City of Beauty' was founded in the 2nd century by the Kirats and it remained a valley kingdom until the late 15th century when it became a sovereign state, together with Kathmandu and Bhaktapur. There are numerous vihars in Patan which were originally built as Buddhist monasteries. They are all quite similar architecturally and consist of two storeys built in the form of a quadrangle. In the centre there is a chaitya (prayer-hall) and a shrine to Sakya Singha. A pair of reliefs with sculpted forms of Ganesha and Mahenkal adorns every entrance. The artist, Dr Oldfield, was Residency Surgeon at Kathmandu from 1850-1863. 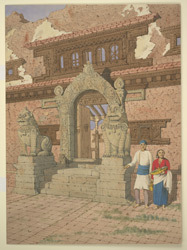 After his death his family published his two volume 'Sketches from Nipal, Historical and Descriptive...' (1880), which described life in the court of the Maharajah Jung Bahadur and also contained descriptions of Buddhist architecture, together with illustrations from Oldfield's own drawings. Hak Vihar is a small building on the west side of the durbar and was formerly known as 'Ratnakar Vihar'. Its most distinguishing feature is its ornately carved stone entrance porch.